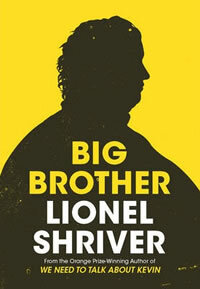 Despite not having read any of Lionel Shriver's books, I have noted her journalism, seen her on tv review shows and recently attended a Q&A session where she spoke about her new novel 'Big Brother'. I have formed an impression of her. She spoke, at London Book Fair last month, about the fact that the novel was based on her brother who died of an obesity-related illness. Personal details do make the book more distinct, especially in the light of a number of titles recently being published on this subject. But Shriver said she didn't want to use her family to sell her book. I was intrigued by a recent profile of the author which appeared in The Sunday Times. This article highlighted the author's own health and fitness regime, in the light of the subject of the new book. It revealed that she only eats once a day, at supper. And she has a formidable exercise routine: 130 press-ups in two sets, 200 side crunches, 500 sit-ups, 3,000 star jumps and 500 burpees in 39 minutes. She wears the same clothes all week to save on washing and never turns on the central heating. Fascinating! Is this enough, now, to get me to read her books? Watch this space!